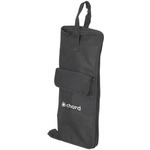 A high quality padded drum stick bag with zip fastener which closes when folded in half. Inside, 3 pockets are stitched into the lining to allow storage of separate pairs of sticks or beaters and outside there is a separate pocket for other accessories. 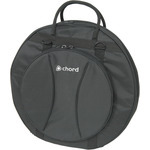 2 adjustable straps with clips allow the opened bag to be slung from a floor tom. 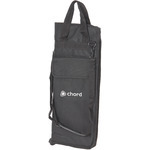 An over-stitched webbing handle and a removable shoulder strap are included for portability. 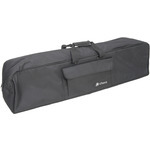 A durable padded gig bag for carrying and storing cymbals. Internally, the bag has 4 dividers to separate and protect sets of cymbals. Cymbals up to 21" diameter can be accommodated. A heavy duty zip fastener enables easy access and a carry handle and shoulder straps are provided for portability.